Routed signs are created by cutting away letters or logos from a sign material to add depth to your sign. These cut out areas can be backed with an acrylic or have the acrylic pushed through the face of the sign to allow for face and halo lighting. The most common type of routed sign is a routed push through sign. A routed push through sign is a letter or logo cut out of a specified sign material. Typically, this material is an acrylic material which is as thick or thicker than the sign face material, and mounted on the inside of the sign face. The acrylic letter or logo material’s thickness extends flush with or through and beyond the front surface of the sign face. Sometimes push through lettering is illuminated through a lighting source on the inside of the sign. To achieve a halo lit result, routed letters that are pushed through can have an opaque material such as vinyl or aluminum adhered to the face to limit the illumination so it only transmits out of the edge of the letter or logo. 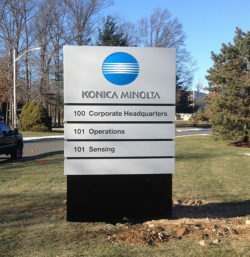 Konica Minolta, Inc., a manufacturer of business and industrial imaging products, wanted new signage at their US corporate headquarters in Ramsey, NJ. 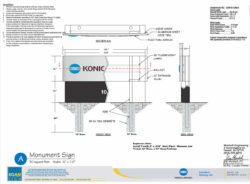 Their sign is a routed monument sign with push through acrylic. The top portion, with the name of the company, has fluorescent lamps so the sign can be illuminated at night to highlight their logo. 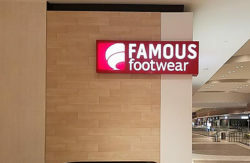 Famous Footwear, a nationwide chain of retail stores dealing in branded footwear, requested signage for a number of their stores. This signage is an internally illuminated sign cabinet with routed push through lettering. 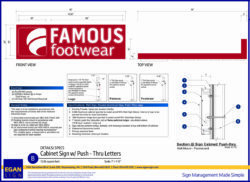 The aluminum cabinet is painted to match a specific pantone color and follows with the brand image of Famous Footwear. The interior of the sign was painted flat white for maximum illumination. There is a 1” acrylic push through with flame polished edges to really make the sign stand out. Aveanna Healthcare, a pediatric home healthcare company, recently had a name change due to a company merger. Because of this, they requested a new interior reception area sign at one of their corporate locations. They went with a routed sign with a portion of it being push through. The heart logo on the sign is push through with a digitally printed vinyl overlay. 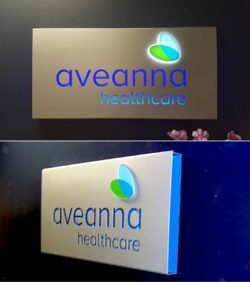 The name “Aveanna Healthcare” on the sign is routed without acrylic backing and is illuminated with the application LED modules placed in the base of the pan sign. This ambient lighting illuminates the routed letters and push through logo. Since the ends of the sign are open, the light shines out the sides of the sign giving it a more dramatic appearance. To learn more about custom interior signs for your business click here. 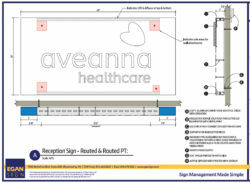 Do you think routed signs are a good fit or your company or have questions about them? Don’t hesitate to contact us to start a conversation about routed signs.